Arch Express is a state-certified women-owned courier company serving the needs of business in a 150-mile radius of St. Louis, Missouri. 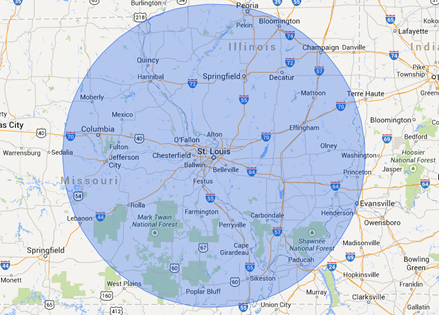 We also deliver to the Kansas City, Missouri area six times per week. When it comes to service, Arch Express DELIVERS! Providing courier and commercial delivery services, Arch Express tailors to your very needs. From delivering baseball tickets to a client on the day of the game, to getting a bid that needs to be submitted and stamped by a specific date and time, to delivering a part you need to get to your staff at a job site...we've got you covered. Stress-Free! Click here to discover the benefits of choosing Arch Express. Route: We tailor the delivery schedule to meet your needs. Rush: Your package is picked up and delivered within approximately 60 minutes of your call. Two Hour: Your package is picked up and delivered within two hours of your call. 4 Hour: Your package is picked up and delivered within four hours of your call. Same Day: Package is called in before 10:00 am and delivered before 5:00 pm the same day. Instead of waiting on the mailman or leaving the office to go to the bank, make your business run more efficiently by having Arch Express provide you with daily/weekly Post Office or Bank Lock Box pick-ups and deliveries made according to your time schedule. Have your own drivers, but need help with the overflow? Arch Express delivers medical supplies to Doctor's Offices and Hospitals on a daily basis, carrying anything from a single box of supplies to a skid of examining gloves. We can actually sort, separate and stage deliveries by zip code/region at your facility. Our dedicated staff and trained drivers have extensive experience in picking up and delivering pharmaceutical drugs to pharmacies, hospitals and nursing homes. Arch Express courier drivers are bonded and insured and have passed DOT drug testing procedures. We handle anything from scheduled daily routes to stat emergency deliveries. Arch Express drivers are picking up from Dialysis labs and Doctors' offices on a daily basis. All drivers are trained to follow strict protocols in the handling of specimens and confidential records to ensure that time sensitive, critical deliveries are made safely and on time. We are HIPAA compliant and will work with you to develop a customized delivery program that meets your needs. When seconds matter, trust Arch Express to picks up and deliver transplant tissue/organs to hospitals and surgery centers throughout Missouri and Southern Illinois. All of our drivers are timely, professional and confidential. We can handle just about every medical "type" delivery! As you can see from the various medical "type" deliveries we do just about everything. Need several pallets delivered? Have a large item that won't fit in a cargo van? Call Arch Express! We have several 24-foot dock-high trucks with a lift gate. Each truck is equipped with load straps and a pallet jack. Call today for a quote. As you can see...we've got you covered! Arch Express looks forward to providing you with our superior service and excellence in customer satisfaction!